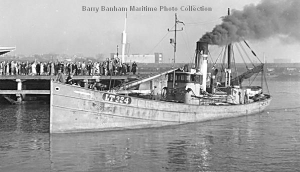 7.5.1894: Launched by Cochrane & Cooper, Beverley (Yd.No.104) for Thomas Campbell Moss & Frederick Moss, Grimsby (32/64 joint owners); Frederick Emil Hagerup (8/64), Charles Denton Holmes (8/64), Grimsby and George Cooper (8/64), Arthur Cochrane (8/64), Beverley as DIAMOND. 29.5.1894: Registered at Grimsby (GY603). 29.5.1894: Thomas Campbell Moss designated managing owner. 29.5.1894: Vessel mortgaged 64/64) to The Hull Banking Co Ltd, Hull (A). 1.1.1895: Mortgage (A) transferred to The York City & County Banking Co Ltd, York. 9.11.1895: Vessel mortgaged (64/64) to The York City & County Banking Co Ltd, York (B). 5.6.1901: Andrew Cochrane and George Cooper shares (8/64 each) sold to Thomas Campbell Moss & Frederick Moss (48/64 joint owners), Grimsby. 5.6.1901: Thomas Campbell Moss continues as manager. 9.11.1901: Frederik Emil Hagerup (8/64) shares mortgaged to Arthur Henry Leslie Melville & Eustace Albert Smith, Grimsby, joint mortgagees (C). 1.7.1908: Vessel mortgaged (64/64) to The York City & County Banking Co Ltd, York (D). 2.12.1914: Charles Denton Holmes shares (8/64) sold to Thomas Campbell Moss & Frederick Moss (56/64 jointly), Grimsby. 22.9.1911: Frederick Emil Hagerup shares (8/64) sold to Thomas Campbell Moss & Frederick Moss (64/64 jointly), Grimsby. 18.12.1914: Vessel mortgaged (64/64) to London Joint Stock Bank Ltd, London (E). 29.5.1917: Requisitioned for Fishery Reserve (1-6pdr HA). Renamed DIAMOND II. 1919: Released and reverted to DIAMOND (GY603). 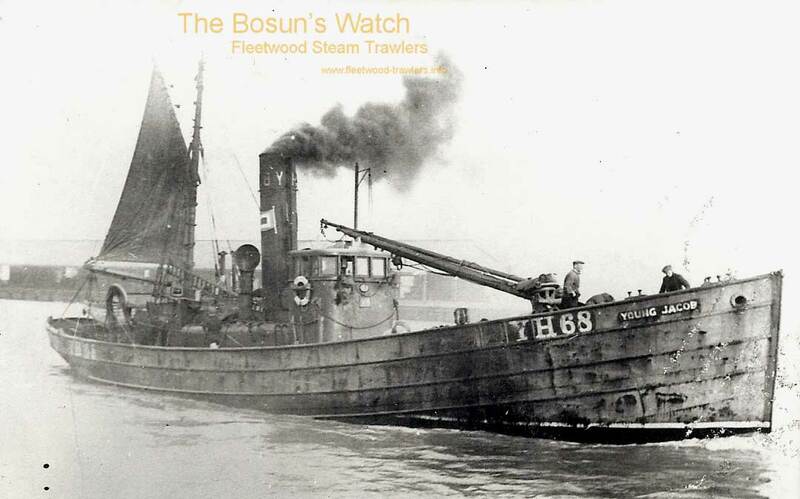 14.2.1921: Sold to T. C. & F. Moss Ltd (64/64), Grimsby. 21.3.1921: Thomas Campbell Moss appointed manager. 8.10.1921: William Thomas Moss appointed manager. 22.12.1945: Sold to Jubilee Fishing Co Ltd (64/64), London. 1.1.1946: Ernest Thomas Milton appointed manager. 1940s-1950s: Seasonal fishing from Fleetwood. 07.1952: Sold for breaking up. 26.7.1952: Grimsby registry closed “Ship being broken up”. 15/08/2013: Page published. 2 updates since then. This entry was posted in Seasonal Visitors, Steam Trawlers and tagged No Fleetwood owners, Seasonal on August 15, 2013 by Fred Smith. 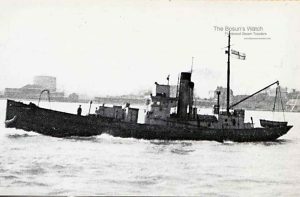 7.3.1927: Launched by Cochrane & Sons Ltd, Selby (Yd.No.999) for George Catchpole (32/64); Frederick Ernest Catchpole (16/64) & Frederick Mullender (16/64), Lowestoft as ONE ACCORD. 9.4.1927: Completed (Fred Ingram, Milford, manager). 10.6.1927: Registered at Lowestoft (LT324). 19.6.1927: First landing at Milford. 23.10.1929: Deckhand Edward W. Read fell overboard, 2nd Engineer William Turrell (27) of Kessingland, jumped in the sea fully clothed in oilskins and seaboots, but failed to reach him before he drowned (Turrell was awarded the Royal Humane Society’s Bronze Medal). 23.12.1929: Sold to George Frederick Catchpole (32/64); Francis George Gamble (16/64); Orlando Frederick Mullender (16/64), Lowestoft. 21.3.1934: Sold to George Catchpole (32/64); Frederick Ernest Catchpole (16/64) & Francis George Gamble (16/64), Lowestoft. Landing into Fleetwood (Lowestoft Fish Selling Co Ltd, managing agents) and Milford. 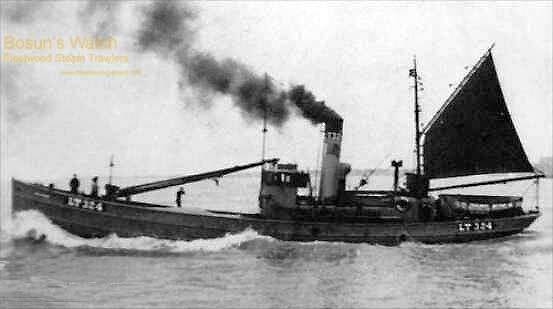 7.1930: Fishing out of Fleetwood in Irish Sea (Sk. Francis George Gamble). 9.7.1930: With KINGSTON (FD144) (Sk. Edward Cook, Lowestoft) arrested by HMS SPEY 91/2 miles W-S-W of Ailsa Craig suspected of trawling in the Firth of Clyde. Taken to Campbeltown where nets and gear were landed. 10.7.1930: At a special sitting of Campbeltown Sheriff Court, George Gamble was charged with illegal trawling and failing to show correct signals when fishing. Cook pleaded not guilty and was ordered to find bail of £120. 16.7.1930: At Campbeltown Sheriff Court, Gamble was found guilty of illegal trawling but the charge of failing to show a fishing signal was not proven. A fine of £100 was imposed with forfeiture of nets and gear. 16.11.1939: Last landing at Milford. Requisitioned for war service as a minesweeping drifter (P.No.FY.983) (Hire rate £49.1.9d/month). 21.2.1945: Sold to Frederick Ernest Catchpole (16/64); John Francis Gamble and D. G. Gamble (16/64 joint); Ernest Herbert Holland and Frederick Ernest Catchpole (32/64 joint). Lowestoft. 19.3.1945: Sold to Accord (Lowestoft) Ltd, Lowestoft (Frederick Ernest Catchpole, manager). 18.3.1949: Sold to Gilbert & Co Ltd, Lowestoft (Arthur G. Gilbert, manager). 18.10.1952: At Lowestoft landed 125 crans of herring. 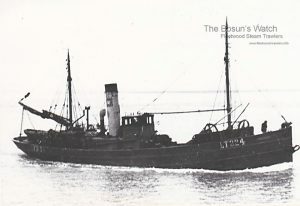 18.3.1958: Sold to Anson Steam Trawler Co Ltd, Milford Haven (John N. Picton, manager). 17.11.1959: Sold to Picton Bros (Milford Haven) Ltd, Milford Haven (John N. Picton, manager). 30.8.1960: Completed trials after conversion to motor by L.B.S. Engineering Ltd, Lowestoft, fitted with 5-cyl 4 stroke 315bhp oil engine by Mirrlees, Bickerton & Day Ltd, Stockport. 9.1960: Re measured 111g 39n. 10.12.1969: Sailed Milford for fishing grounds (Sk. Bill Philips); seven crew. In good visibility, 2.5 miles off the Smalls Lighthouse in collision with German motor tanker YORKSAND (500grt/1964) sustaining damage to stem and bow plating. Tanker stood by until stern trawler ROSS FAME (GY1360) arrived in response to distress; escorted to Milford. 11.12.1969: Arrived Milford. Laid up. 2.1970: As a result of survey considered beyond economical repair. Sold to Haulbowline Industries Ltd, Passage West, Cork for breaking up. 27.6.1989: Lowestoft registry closed (mortgage discharged). 17/03/2011: Page published. 7 updates since then. 16/11/2018: Removed FMHT watermarks from images. This entry was posted in Drifter/Trawler, Seasonal Visitors, Steam Trawlers, Steamers (Picture), Wartime Visitors and tagged Drifter/Trawler, No Fleetwood owners, Seasonal, Wartime Visitor on March 17, 2011 by Fred Smith. 1914: Launched by Livingstone & Cooper Ltd, Hessle (Yd.No.15?) for John Thomas Cullen Salmon, Gt. Yarmouth as JACK SALMON. 8.1914: Completed for The Great Yarmouth Steam Drifters Ltd, Gt. Yarmouth (Thomas A. Beeching, manager). 17.8.1914: Registered at Yarmouth (YH68). 1.1915: Requisitioned for war service as an A/S net drifter (Ad.No.1023). 1917: Based at Portsmouth mine research tender. 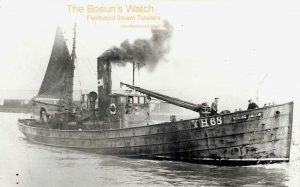 By 12.3.1919: Returned to owner at Yarmouth (Yarmouth Steam Drifters Ltd). 20.3.1924: Sold to Jacob George, Gt. Yarmouth (managing owner). 28.1.1927: Sold to Jacob George (32/64) & John George (32/64), Gt. Yarmouth. 14.5.1924: Registered at Yarmouth as YOUNG JACOB (YH68). 1930s: Seasonal trawling from Fleetwood. 24.1.1934: Sold to John George, Gt. Yarmouth (managing owner). 17.11.1939: Requisitioned for war service as a minesweeping drifter (P.No.FY.975) (Hire rate £27.13.6d). 6.1944: Re-deployed on miscellaneous naval duties. 10.1944: Employed on port duties. 11.3.1946: Sold to George Richard Newson (16/64), Winterton; William Herbert Balls, Ronald Balls & John Leslie Balls, Gt. Yarmouth; Claude Perrett, Gorleston; Norford Arthur Suffling & Ida Edith Suffling, Brundall (all 8/64). 13.8.1953: Norford Suffling died, eight shares left to Barclays Bank Ltd & Ida Suffling. 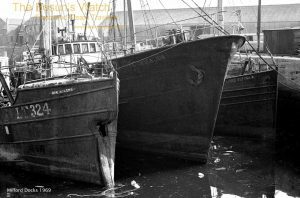 27.11.1953: At Yarmouth landed 140 crans of herring; top boat with OCEAN DAWN (YH47). 12.10.1954: Yarmouth registry closed on advice from owners. 22/02/2011: Page published. 6 updates since then. 10/11/2018: Removed FMHT watermarks from images.